I posted this on SS&FG as well looking for advice or ideas. Looks like it's a pre-war British Hub Co. "Solo" drum brake hub. It's in great condition, 40 holes, British threads and lockring of course. 110 oln. It even looks like nickel plate but I can't tell for sure. Now what? Lace it to a 700c Super Champion 58 and make a club bike? A Raleigh Sports EA3 ? An old roadster or delivery bike? Looks dangerous. You should send it to me for proper disposal. Go with 590mm wheels. That would be a more appropriate size, IMO. Great find! Is the sprocket side threaded where you can spin on a SS free wheel? Nice vintage hub, needs to be on a 50's frame. My first thought was it might be for a tandem. A tandem hub would make perfect sense. Good thinking! It's typical of other period fixed hubs as there's enough threads to catch a freewheel. I prefer fixed over single speeds though so I'm thinking a Sports frame will be be the way to go. Or a 48/49 Lenton Clubman. Hopefully the brake will work well enough to take the stress off my aging knees. I've had 3 scopes over the years and really don't want any more. And a tandem is certainly a good possibility even though it's called a Solo. 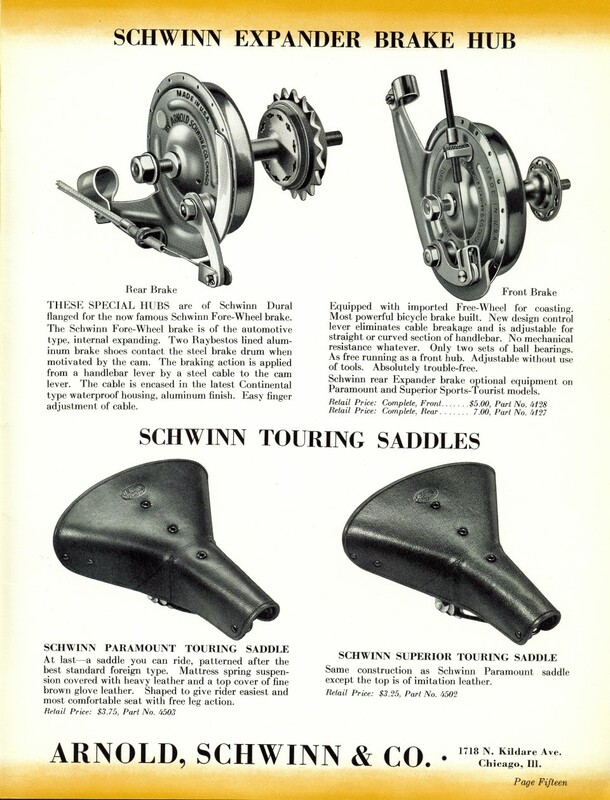 I know it's not the hub pictured below, but it has a lot in common with this "expander brake hub" from a 1939 Schwinn Paramount/Superior Catalogue. Very interesting, probably very old. Last edited by Maddox; 03-26-10 at 01:35 PM. Nah, 597s (EA-1) with some vintage Dunlop skins. On the other hand, it would be perfect on my DL-1.